The RTM322 is a 100% Turbomeca engine powering medium-heavy helicopters. It is designed and certified to equip both civil and military platforms. 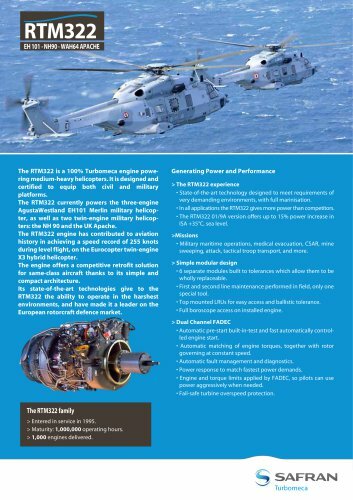 The RTM322 currently powers the three-engine AgustaWestland EH101 Merlin military helicopter, as well as two twin-engine military helicopters: the NH 90 and the UK Apache. The RTM322 engine has contributed to aviation history in achieving a speed record of 255 knots during level flight, on the Eurocopter twin-engine X3 hybrid helicopter. The engine offers a competitive retrofit solution for same-class aircraft thanks to its simple and compact architecture. Its state-of-the-art technologies give to the RTM322 the ability to operate in the harshest environments, and have made it a leader on the European rotorcraft defence market. Generating Power and Performance > The RTM322 experience • State-of-the-art technology designed to meet requirements of very demanding environments, with full marinisation. • In all applications the RTM322 gives more power than competitors. • The RTM322 01/9A version offers up to 15% power increase in ISA +35°C, sea level. >Missions • Military maritime operations, medical evacuation, CSAR, mine sweeping, attack, tactical troop transport, and more. > Simple modular design • 6 separate modules built to tolerances which allow them to be wholly replaceable. • First and second line maintenance performed in field, only one special tool. • Top mounted LRUs for easy access and ballistic tolerance. • Full boroscope access on installed engine. > Dual Channel FADEC • Automatic pre-start built-in-test and fast automatically controlled engine start. • Automatic matching of engine torques, together with rotor governing at constant speed. • Automatic fault management and diagnostics. • Power response to match fastest power demands. • Engine and torque limits applied by FADEC, so pilots can use power aggressively when needed. • Fail-safe turbine overspeed protection. The RTM322 family > Entered in service in 1995. > Maturity: 1,000,000 operating hours.